Will not charge a fee or take a second collection. With your permission, however, he will place informational brochures in the pews. 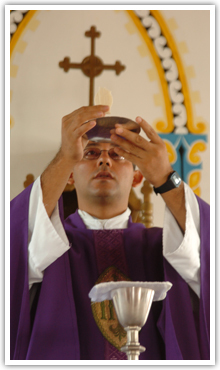 Will celebrate masses, hear confessions, and administer all other Sacraments in the absence of a parish priest. Creates an awareness of the plight of the poor internationally and gives parishioners an opportunity to help. You can contact our Parish Services Department by emailing us at: priests@crosscatholic.org or by calling (800) 914-2420 to host a Cross Catholic Outreach Priest or to request more information. Download and print the PDFs below for informational materials or contact us to have this packet of information sent to you by mail.